Graffiti Tagging Paste Ups pictures from Toronto, Canada. These are pictures taken of what I consider real graffiti or tagging. Most of images are taken in back alleys in the last couple of years. Although, I have included few on the sides of trains I am not sure that they fit into this category. However, graffiti is usually considered an illegal activity so the pictures included here would fall into that category. A great deal of the street art graffiti found here would be classified as humurous although, some people might not share the taggers view of humour. Bombing and tagging sometimes occurs on the sides of abandoned places usually building that are going to be demolished. 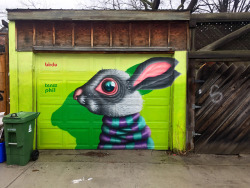 Many people frown on this form of street art but it really is the original form and a lot of the ‘legitimate’ mural artists generally get their start by doing this form of expression. 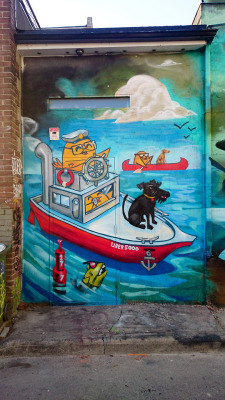 Vizsla Bacon Aerosol Mural in East End Toronto.